Shirley Mae’s Café is housed in a 3-story clay-brick building that dates back to 1880… when it was the home of Andrew Willinger, manager of the W.M. & C.D. Campbell Tobacco Company in Louisville, KY. Nestled in the heart of Smoketown, Shirley Mae’s Café is located in the oldest African American community in Louisville… originally a post-Civil War encampment for freed slaves in 1868. 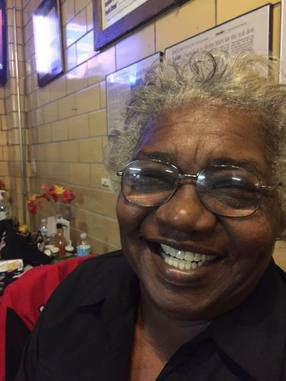 With both of her businesses situated on the outer fringe of the Sheppard Square and Clarksdale Housing Projects in Smoketown — Louisville’s first African-American community — Shirley Mae sought to cut through the apathy that lassoed the community and inspire the youth in the nearby housing projects to aspire to finish their education and to avoid early teenage pregnancy/parenthood and criminal pursuits. The event was always free to the public to ensure that these kids would always be afforded the opportunity to participate and be included. In fact, Shirley Mae depleted her retirement funds to fund this event annually to ensure that the event remained free to the public… and that it remained in the projects… easily accessible to the children there. While Shirley Mae and her sons and daughters had learned about the black jockeys who had pioneered the Kentucky Derby from a set of World Book Encyclopedias she purchased back in the 1960s, she was shocked to find that no one in Smoketown had ever heard of these black pioneers. The Salute to Black Jockeys then took on a second misson… to educate African-Americans about their rich roots in the Kentucky Derby and to give them their own Kentucky Derby event to celebrate those roots during the Kentucky Derby Festival. She is featured in a episode of the ESPN program, Undefeated entitled The Reign of the Black Jockey. Congratulation's Shirley Mae Beard for being such a great inspiration in Smoketown and in many peoples heart.